NASA's Mars Exploration Rover Opportunity entered Victoria Crater during the rover's 1,291st Martian day, or sol, (Sept. 11, 2007). 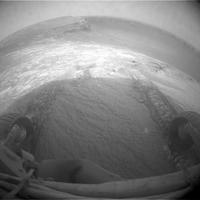 Today, NASA's Mars Exploration Rover Opportunity entered Victoria Crater for the first time. It radioed home information via a relay by NASA's Mars Odyssey orbiter, reporting its activities for the day. Opportunity drove far enough in -- about four meters (13 feet) -- to get all six wheels past the crater rim. Then it backed uphill for about three meters (10 feet). The driving commands for the day included a precaution for the rover to stop driving if its wheels were slipping more than 40 percent. Slippage exceeded that amount on the last step of the drive, so Opportunity stopped with its front pair of wheels still inside the crater. "We will do a full assessment of what we learned from the drive today and use that information to plan Opportunity's descent into the crater," said John Callas, rover project manager at NASA's Jet Propulsion Laboratory, Pasadena, Calif. Once Opportunity begins its extended exploration inside the crater, the rover will investigate layered rocks exposed on the interior slope.